We all knew him as a suave, debonair, charmer of a man. He was the essence of “Hollywood”, always formally dressed, clean shaven, and ready to get the job done. However, not much is known about Cary Grant’s personal life. Everything from his sexual orientation to his family traditions and customs have been topics of speculation for decades. While most of his sexual life still remains a mystery, the life Cary Grant treasured, his life off camera, has finally come to light. 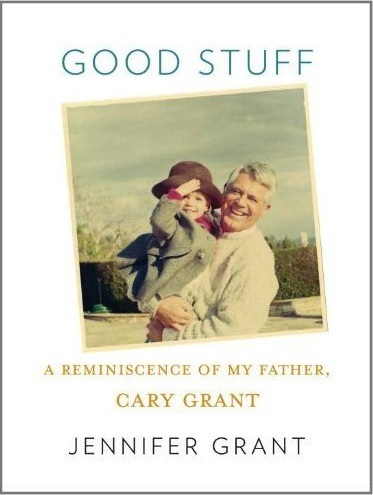 In her loving tribute to her father, Jennifer Grant’s book Good Stuff: A Reminiscence of My Father, Cary Grant shows us a man so few knew…a man devoted to his one and only daughter, a man clinging on to youth during a time when he should be enjoying retirement. A caregiver, a friend, a teacher, a style icon, and, perhaps most importantly, a father. Good Stuff is a fond look back at the 20 or so years Jennifer was able to spend with her father before he passed away. Sprinkled with photographs, memories, letters, and notes, this memoir shows us a rare and beautiful bond between father and daughter. Written almost like a love letter, Jennifer shares everything from her father’s obsession with recording their conversations to how he taught her to pay bills and budget money. She wisely skips over gossip surrounding her father’s sexuality and marriages…claiming it’s none of her business what he did behind closed doors…so why should it be any of ours? This simple yet powerful dedication to Cary Grant is one of the most touching and personal books I’ve ever read. It’s honest, raw, and shows a man with flaws, a man with struggles, a man learning–just like the rest of us–the struggles and sensations of family life. NEXT WEEK: A fascinating account of an artist who devoted his life to his work in the painful belief that it was all he had. Good grief.